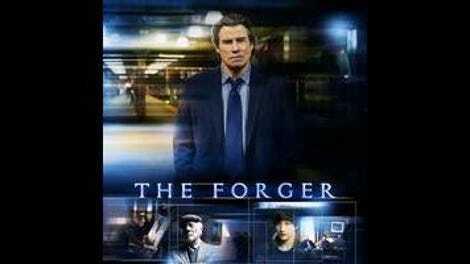 As Ray Cutter, the title character in The Forger, John Travolta speaks with a sleepy mumble that makes it hard to hear what he’s saying a lot of the time. 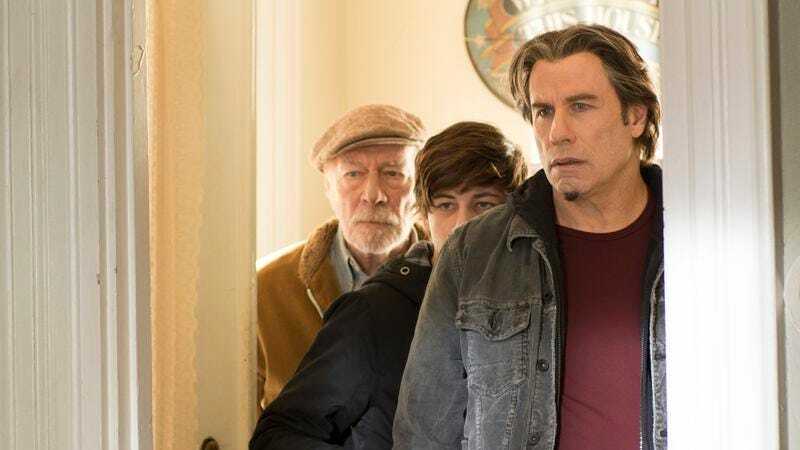 The movie is set in Boston, but Travolta doesn’t seem to be attempting a Boston accent; it’s more as if he’s trying to minimize his own distinctive palooka cadence. Or maybe it’s just age catching up with him, in a way that can’t be disguised as readily as some others. (That’s quite an impressive head of hair for a 61-year-old.) In any case, the modification has sapped him of his movie-star charisma, and there’s precious little left in its place. Nicolas Cage at least manages to bring the occasional jolt of electricity to disposable genre tripe like this. Travolta is practically comatose. Granted, he’s playing a ridiculous character from which any sensible actor would want to distance himself. First seen staring solemnly into space in a prison cell, Ray is allegedly the world’s greatest art forger, but he’s also, improbably, a total badass who’ll readily lay out multiple thugs via a baseball bat to the skull. And he’s sensitive, too: Ray has a crime lord named Keegan (Anson Mount) use his influence to get him paroled because Ray’s teenage son, Will (Tye Sheridan), has terminal cancer, and Ray wants to spend some time with him. Needless to say, this arrangement has a hefty price tag. Keegan wants Ray to repay the favor by making a perfect copy of Monet’s Woman With A Parasol—Madame Monet And Her Son, then breaking into Boston’s Museum Of Fine Arts (which is not where that painting actually hangs, but let’s be charitable and assume it’s part of a traveling exhibition) to steal the original and replace it with his forgery. Sure, why not? Because forgers also frequently rob museums (multi-talented! ), and they’ll often take along a dying son in order to give the kid one last thrill/bonding experience before he croaks. Inertly directed by British TV vet Philip Martin (Hawking, Prime Suspect 7: The Final Act), The Forger has no fun at all with its climactic heist sequence, which involves such chestnuts as hiding in an air duct (or maybe it’s just a ceiling panel—at any rate, no security camera would ever spot young Will climbing in there) and determining a keypad code by observing which numbers are most frequently pressed (but how do you know the correct order?). It also squanders Christopher Plummer (as Ray’s dad), Jennifer Ehle (as Will’s drug-addict mother), and Abigail Spencer (as the cop who wants to use Ray to take down Keegan). Mostly, though, it provides Travolta with endless opportunities to do nothing much at all. Ray comes across as bored and listless, seemingly devoid of any inner life. There’s no passion underlying his devotion to Will, which neuters the intended impact of The Forger’s remarkably downbeat final scene. The brushstrokes are all technically correct, but without any hint of creative spark, it’s just empty facility.